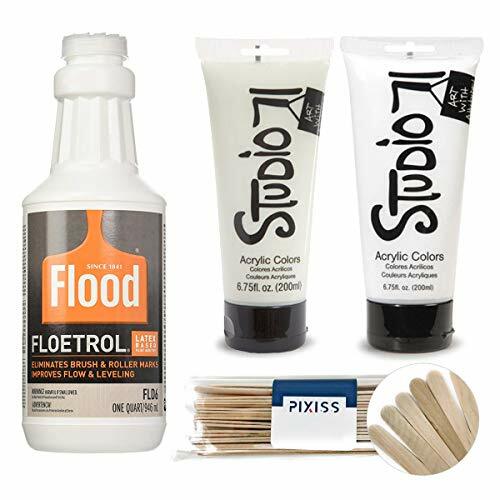 1 quart Floetrol paint additive by FLOOD/PPG, bottle of 6.75oz Studio 71 white and glow in the dark acrylic paints and 20 Pixiss wood mixing sticks. FLOETROL - 1 quart Floetrol additive (FLD6-04) by FLOOD/PPG. Fortifies acrylic and latex paints to improve performance and reduce brush marks. Allows latex paint to spray like oil-based paint. GLOW IN THE DARK - 6.75 ounce Studio 71 glow in the dark acrylic paint. Excellent covering power. Smooth consistency. Permanent when dry. Add luminescence to a variety of surfaces including wood, canvas, fabric and more. Simply charge the glow by exposing your artwork to light! WHITE- 6.75 ounce Studio 71 white acrylic paint. Excellent covering power. Smooth consistency. Permanent when dry. PIXISS MIXING STICKS - 20x Pixiss Stix Mixing Sticks for mixing your resin, stain, epoxy, paint and more. If you have any questions about this product by GrandProducts, contact us by completing and submitting the form below. If you are looking for a specif part number, please include it with your message.